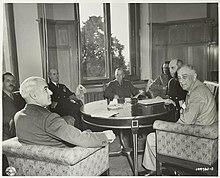 The Yalta Conference, also known as the Crimea Conference and code-named the Argonaut Conference, held from 4 to 11 February 1945, was the World War II meeting of the heads of government of the United States, the United Kingdom and the Soviet Union for the purpose of discussing Germany and Europe's postwar reorganization. The three states were represented by President Franklin D. Roosevelt, Prime Minister Winston Churchill and Premier Joseph Stalin, respectively. The conference convened near Yalta in Crimea, Soviet Union, within the Livadia, Yusupov, and Vorontsov Palaces. The aim of the conference was to shape a post-war peace that represented not just a collective security order but a plan to give self-determination to the liberated peoples of post-Nazi Europe. The meeting was intended mainly to discuss the re-establishment of the nations of war-torn Europe. However, within a few short years, with the Cold War dividing the continent, Yalta became a subject of intense controversy. 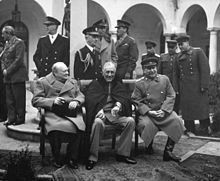 Yalta was the second of three major wartime conferences among the Big Three. It was preceded by the Tehran Conference in November 1943, and was followed by the Potsdam Conference in July 1945. It was also preceded by a conference in Moscow in October 1944, not attended by President Roosevelt, in which Churchill and Stalin had carved up Europe into Western and Soviet spheres of influence. The Potsdam Conference was to be attended by Stalin, Churchill (who was replaced halfway through by the newly elected British prime minister Clement Attlee) and Harry S. Truman, Roosevelt's successor after his death. General Charles de Gaulle was not present at either the Yalta or Potsdam conferences; a diplomatic slight that was the occasion for deep and lasting resentment. De Gaulle attributed his exclusion from Yalta to the longstanding personal antagonism towards him by Roosevelt, although the Soviet Union had also objected to his inclusion as a full participant. But the absence of French representation at Yalta also meant that extending an invitation for De Gaulle to attend the Potsdam Conference would have been highly problematic; as he would then have felt honor-bound to insist that all issues agreed at Yalta in his absence would have had to be re-opened. By the time of the Yalta Conference, the Western forces consisting of the United Kingdom, the United States, Poland, Canada, and the governments-in-exile of France and Belgium, led by British general Bernard Montgomery and American generals Dwight D. Eisenhower and Omar Bradley, had liberated all of France and Belgium and were advancing into Germany, leading to the Battle of the Bulge. In the east, Red Army Marshal Georgy Zhukov's forces were 65 km (40 mi) from Berlin, having already pushed back the Nazis from Poland, Romania, Bulgaria, and most of Yugoslavia. By February, Germany only had loose control over the Netherlands, Norway, Denmark, Austria, Northern Italy, and Northern Yugoslavia. The initiative for calling a second 'Big Three' conference had come from Roosevelt, initially hoping to meet before the US Presidential elections in November 1944, but subsequently pressing for a meeting early in 1945 at a 'neutral' location in the Mediterranean; Malta, Cyprus or Athens being suggested. Stalin, insisting that his doctors opposed any long trips, rejected these options. He proposed instead that they meet instead at the Black Sea resort of Yalta, in the Crimea. Stalin's fear of flying also was a contributing factor in this decision. Nevertheless, Stalin formally deferred to Roosevelt as the 'host' for the conference; all plenary sessions were to be held in the American accommodation at the Livadia Palace, and Roosevelt is invariably seated centrally in the group photographs (all of which were taken by Roosevelt's official photographer). Each of the three leaders had his own agenda for post-war Germany and liberated Europe. Roosevelt wanted Soviet support in the U.S. Pacific War against Japan, specifically for the planned invasion of Japan (Operation August Storm), as well as Soviet participation in the United Nations; Churchill pressed for free elections and democratic governments in Eastern and Central Europe (specifically Poland); and Stalin demanded a Soviet sphere of political influence in Eastern and Central Europe as an essential aspect of the USSR's national security strategy. Stalin's position at the conference was one which he felt was so strong that he could dictate terms. According to U.S. delegation member and future Secretary of State James F. Byrnes, "it was not a question of what we would let the Russians do, but what we could get the Russians to do." Poland was the first item on the Soviet agenda. Stalin stated that "For the Soviet government, the question of Poland was one of honor" and security because Poland had served as a historical corridor for forces attempting to invade Russia. In addition, Stalin stated regarding history that "because the Russians had greatly sinned against Poland", "the Soviet government was trying to atone for those sins." Stalin concluded that "Poland must be strong" and that "the Soviet Union is interested in the creation of a mighty, free and independent Poland." Accordingly, Stalin stipulated that Polish government-in-exile demands were not negotiable: the Soviet Union would keep the territory of eastern Poland they had already annexed in 1939, and Poland was to be compensated for that by extending its western borders at the expense of Germany. Contrasting with his prior statement, Stalin promised free elections in Poland despite the Soviet sponsored provisional government recently installed by him in Polish territories occupied by the Red Army. Roosevelt wanted the USSR to enter the Pacific War with the Allies. One Soviet precondition for a declaration of war against Japan was an American official recognition of Mongolian independence from China (the Mongolian People's Republic had already been the Soviet satellite state from its own beginnings in 1924, through World War II), and a recognition of Soviet interests in the Manchurian railways and Port Arthur (but not asking the Chinese to lease), as well as deprivation of Japanese soil (such as Sakhalin and Kuril Islands) to return to Russian custody since the Treaty of Portsmouth; these were agreed without Chinese representation, consultation or consent, with the American desire to end war early thereby reducing American casualties. Stalin agreed that the Soviet Union would enter the Pacific War three months after the defeat of Germany. Stalin pledged to Truman to keep the nationality of the Korean Peninsula intact as Soviet Union entered the war against Japan. Furthermore, the Soviets had agreed to join the United Nations, given the secret understanding of a voting formula with a veto power for permanent members of the Security Council, thus ensuring that each country could block unwanted decisions. At the time, the Red Army had occupied Poland completely and held much of Eastern Europe with a military power three times greater than Allied forces in the West. The Declaration of Liberated Europe did little to dispel the sphere of influence agreements that had been incorporated into armistice agreements. All three leaders ratified the agreement of the European Advisory Commission setting the boundaries of post-war occupation zones for Germany: three zones of occupation, one for each of the three principal Allies: The Soviet Union, the United Kingdom, and the United States. They also agreed to give France a zone of occupation, carved out of the US and UK zones; although De Gaulle on principle subsequently refused to accept that the French zone would be defined by boundaries established in his absence, ordering French forces to occupy Stuttgart in addition; only withdrawing when threatened with the suspension of essential American economic supplies. Churchill at Yalta then argued that the French would necessarily also need to be a full member of the proposed Allied Control Council for Germany. Stalin resisted this, until eventually Roosevelt backed Churchill's position; but Stalin still remained adamant that the French should not be admitted to full membership of the Allied Reparations Commission to be established in Moscow, only relenting at the Potsdam Conference. Also, the Big Three agreed that all original governments would be restored to the invaded countries (with the exceptions of Romania and Bulgaria, where the Soviets had already liquidated most of the governments;[clarification needed] and Poland whose government-in-exile was also excluded by Stalin) and that all civilians would be repatriated. The Declaration of Liberated Europe is a declaration that was created by Winston Churchill, Franklin D. Roosevelt, and Joseph Stalin during the Yalta Conference. It was a promise that allowed the people of Europe "to create democratic institutions of their own choice". The declaration pledged, "the earliest possible establishment through free elections governments responsive to the will of the people." This is similar to the statements of the Atlantic Charter, which says, "the right of all people to choose the form of government under which they will live." . German reparations were partly to be in the form of forced labour. The forced labour was to be used to repair damage that Germany had inflicted on its victims. However, laborers were also forced to harvest crops, mine uranium, and do other work. (see also Forced labor of Germans after World War II and Forced labor of Germans in the Soviet Union). Stalin agreed to enter the fight against the Empire of Japan "in two or three months after Germany has surrendered and the war in Europe is terminated", and that as a result, the Soviets would take possession of Southern Sakhalin and the Kuril Islands, the port of Dalian would be internationalized, and the Soviet lease of Port Arthur would be restored, among other concessions. For the bombing of Japan, agreement was reached on basing American B-29s near the mouth of the Amur River in the Komsomolsk-Nikolaevsk area (not near Vladivostock as earlier proposed), though this did not eventuate. General Antonov also said that the Red Army would take the southern half of Sakhalin Island as one of its first objectives, and American assistance in the defence of Kamchatka would be desirable. Nazi war criminals were to be found, and put on trial in the territories where their crimes had been committed; Nazi leaders were to be executed. The Big Three further agreed that democracies would be established, all liberated European and former Axis satellite countries would hold free elections and that order would be restored. In that regard, they promised to rebuild occupied countries by processes that will allow them "to create democratic institutions of their own choice. This is a principle of the Atlantic Charter – the right of all peoples to choose the form of government under which they will live". The resulting report stated that the three would assist occupied countries to form interim government that "pledged to the earliest possible establishment through free elections of the Governments responsive to the will of the people" and to "facilitate where necessary the holding of such elections." The agreement called on signatories to "consult together on the measures necessary to discharge the joint responsibilities set forth in this declaration." During the Yalta discussions, Molotov inserted language that weakened the implication of enforcement of the declaration. Regarding Poland, the Yalta report further stated that the provisional government should "be pledged to the holding of free and unfettered elections as soon as possible on the basis of universal suffrage and secret ballot." The agreement could not conceal the importance of acceding to pro-Soviet short-term Lublin government control and of eliminating language calling for supervised elections. According to President Roosevelt, "if we attempt to evade the fact that we placed somewhat more emphasis on the Lublin Poles than on the other two groups from which the new government is to be drawn I feel we will expose ourselves to the charges that we are attempting to go back on the Crimea decision." Roosevelt conceded that, in the words of Admiral William D. Leahy, the language of Yalta was so vague that the Soviets would be able to "stretch it all the way from Yalta to Washington without ever technically breaking it." The final agreement stipulated that "the Provisional Government which is now functioning in Poland should therefore be reorganized on a broader democratic basis with the inclusion of democratic leaders from Poland and from Poles abroad." The language of Yalta conceded predominance of the pro-Soviet Lublin Government in a provisional government, albeit a reorganized one. Because of Stalin's strong promises and admission of guilt over Poland, Churchill believed that he would keep his word regarding Poland, remarking "Poor Neville Chamberlain believed he could trust Hitler. He was wrong. But I don't think I am wrong about Stalin." At that time, over 200,000 soldiers of the Polish Armed Forces in the West were serving under the high command of the British Army. Many of these men and women were originally from the Kresy region of eastern Poland including cities such as Lwów and Vilnius. They had been deported from Kresy to the eastern regions of Russia, or sent to Gulags when the USSR occupied this region of Poland in 1939. Two years later, when Churchill and Stalin formed an alliance against Hitler, the Kresy Poles were released from the Gulags in Siberia, formed the Anders Army and marched to Persia to create the II Corps (Poland) under British high command. These Polish troops were instrumental to the Allied defeat of the Germans in North Africa and Italy, and hoped to return to their homes in Kresy in an independent and democratic Poland at the end of the War. But at Yalta, Roosevelt and Churchill largely acceded to Stalin's demands to annex the territory which in the Nazi-Soviet Pact he and Hitler had agreed to the Soviet Union controlling, including Kresy, and to carry out Polish population transfers (1944–1946). Consequently, they in effect agreed that tens of thousands of veteran Polish troops under British command should lose their Kresy homes to the Soviet Union. In reaction, thirty officers and men from the II Corps (Poland) committed suicide. Churchill defended his actions at Yalta in a three-day Parliamentary debate starting on February 27, which ended in a vote of confidence. During the debate many MPs criticised Churchill and expressed deep reservations about Yalta and support for Poland, with 25 drafting an amendment protesting the agreement. These members included: Arthur Greenwood; Sir Archibald Southby, 1st Baronet; Sir Alec Douglas-Home; James Heathcote-Drummond-Willoughby, 3rd Earl of Ancaster and Victor Raikes. After the failure of the amendment, Henry Strauss, 1st Baron Conesford, the Member of Parliament for Norwich, resigned his seat in protest at the British treatment of Poland. When the Second World War ended, a Communist government was installed in Poland. Many Poles felt betrayed by their wartime allies. Many Polish soldiers refused to return to Poland, because of the Soviet repressions of Polish citizens (1939–1946), the Trial of the Sixteen and other executions of pro-Western Poles, particularly the former members of the AK (Armia Krajowa). The result was the Polish Resettlement Act 1947, Britain's first mass immigration law. On March 1, Roosevelt assured Congress that "I come from the Crimea with a firm belief that we have made a start on the road to a world of peace." However, the Western Powers soon realized that Stalin would not honour his promise of free elections for Poland. After receiving considerable criticism in London following Yalta regarding the atrocities committed in Poland by Soviet troops, Churchill wrote Roosevelt a desperate letter referencing the wholesale deportations and liquidations of opposition Poles by the Soviets. On March 11, Roosevelt responded to Churchill, writing, "I most certainly agree that we must stand firm on a correct interpretation of the Crimean decision. You are quite correct in assuming that neither the Government nor the people of this country will support participation in a fraud or a mere whitewash of the Lublin government and the solution must be as we envisaged it in Yalta." By March 21, Roosevelt's Ambassador to the USSR Averell Harriman cabled Roosevelt that "we must come clearly to realize that the Soviet program is the establishment of totalitarianism, ending personal liberty and democracy as we know it." Two days later, Roosevelt began to admit that his view of Stalin had been excessively optimistic and that "Averell is right." Four days later, on March 27, the Soviet Peoples Commissariat for Internal Affairs (NKVD) arrested 16 Polish opposition political leaders that had been invited to participate in provisional government negotiations. The arrests were part of a trick employed by the NKVD, which flew the leaders to Moscow for a later show trial followed by sentencing to a gulag. Churchill thereafter argued to Roosevelt that it was "as plain as a pike staff" that Moscow's tactics were to drag out the period for holding free elections "while the Lublin Committee consolidate their power." The Polish elections, held on January 16, 1947, resulted in Poland's official transformation to a communist state by 1949. Following Yalta, in Russia, when Soviet Foreign Minister Vyacheslav Molotov expressed worry that the Yalta Agreement's wording might impede Stalin's plans, Stalin responded "Never mind. We'll do it our own way later." While the Soviet Union had already annexed several occupied countries as (or into) Soviet Socialist Republics, other countries in central and eastern Europe that it occupied were converted into Soviet-controlled satellite states, such as the People's Republic of Poland, the People's Republic of Hungary, the Czechoslovak Socialist Republic, the People's Republic of Romania, the People's Republic of Bulgaria, the People's Republic of Albania, and later East Germany from the Soviet zone of German occupation. Eventually the United States and the United Kingdom made concessions in recognizing the then Communist-dominated regions, sacrificing the substance of the Yalta Declaration, while it remained in form. At some point of Spring 1945, Churchill had commissioned a contingency military enforcement operation plan (war on the Soviet Union) to obtain "square deal for Poland" (Operation Unthinkable), which resulted in a May 22 report stating unfavorable success odds. The report's arguments included geostrategic issues (possible Soviet-Japanese alliance resulting in moving of Japanese troops from continent to Home Islands, threat to Iran/Iraq) and uncertainties concerning land battles in Europe. 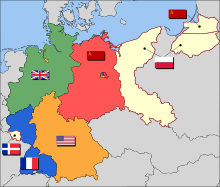 The Potsdam Conference was held from July to August 1945, which included the participation of Clement Attlee (who had replaced Churchill as Prime Minister) and President Harry S Truman (representing the United States after Roosevelt's death). At Potsdam, the Soviets denied claims that they were interfering in the affairs of Romania, Bulgaria and Hungary. 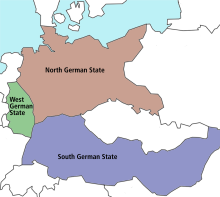 The conference resulted in (1) the Potsdam Declaration regarding the surrender of Japan, and (2) the Potsdam Agreement regarding the Soviet annexation of former Polish territory east of the Curzon Line, and, provisions, to be addressed in an eventual Final Treaty ending World War II, for the annexation of parts of Germany east of the Oder-Neisse line into Poland, and northern East Prussia into the Soviet Union. Four months after the death of Roosevelt, President Truman ordered the dropping of an atomic bomb on Hiroshima on August 6, 1945. ^ Michael M. Boll (January 13, 2015). Cold War in the Balkans: American Foreign Policy and the Emergence of Communist Bulgaria 1943–1947. University Press of Kentucky. pp. 79–. ISBN 978-0-8131-6217-1. ^ Fenby, Jonathan (2012). The General; Charles de Gaulle and the France he saved. Skyhorse. pp. 280–90. ^ Feis, Herbert (1960). Between War and Peace; The Potsdam Conference. Princeton University Press. pp. 128–38. ^ Beevor, Antony (2012). The Second World War. New York: Little, Brown and Company. p. 709. ISBN 978-0-316-02374-0. ^ Fenby, Jonathan (2012). The General; Charles de Gaulle and the France he saved. Skyhorse. p. 282. ^ "Soviet Satellite States". schoolshistory.org.uk. ^ Osmańczyk, Edmund. Encyclopedia of the United Nations and International Agreements: T to Z. p. 2773. ISBN 978-0-415-93924-9. ^ "United Nations". U.S. Department of State. Archived from the original on March 3, 2003. Retrieved September 22, 2014. Voting procedures and the veto power of permanent members of the Security Council were finalized at the Yalta Conference in 1945 when Roosevelt and Stalin agreed that the veto would not prevent discussions by the Security Council. In April 1945 the new U.S. President Truman agreed to General Assembly membership for Ukraine and Byelorussia while reserving the right, which was never exercised, to seek two more votes for the United States. ^ "Agreement Regarding Japan," Protocol Proceedings of the Crimea Conference (February 11, 1945). Online. ^ Ehrman,VI 1956, p. 216. ^ a b c Leffler, Melvyn P. (1986). "Adherence to Agreements: Yalta and the Experiences of the Early Cold War". International Security. 11 (1): 88–123. doi:10.2307/2538877. JSTOR 2538877. ^ "How Communism Took Over Eastern Europe After World War II". July 2010. ^ "WWII Behind Closed Doors: Stalin, the Nazis and the West. In Depth. Uneasy Allies". PBS. December 7, 1941. Retrieved December 19, 2011. ^ Telegram, President Roosevelt to the British prime minister, Washington, 11 March 1945, in United States Department of State, Foreign Relations of the United States, Diplomatic Papers: 1945 Volume V, Europe (Washington: Government Printing Office, 1967), pp. 509–10. ^ Senn, Alfred Erich (2007). Lithuania 1940: revolution from above. Amsterdam; New York: Rodopi. ISBN 978-90-420-2225-6. ^ Granville, Johanna (2004). The First Domino: International Decision Making during the Hungarian Crisis of 1956. Texas A&M University Press. ISBN 978-1-58544-298-0. ^ "Clement Richard Attlee". Archontology.org. Retrieved December 19, 2011. ^ "Potsdam Declaration". Ndl.go.jp. July 26, 1945. Retrieved December 19, 2011. Ehrman, John (1956). Grand Strategy Volume VI, October 1944-August 1945. London: HMSO (British official history). pp. 96–111. Geoffrey Roberts, Stalin’s Wars: From World War to Cold War, 1939–1953 (New Haven: Yale University Press, 2008). Plokhii, Serhii (2010). Yalta: The Price of Peace. New York: Viking Press. ISBN 978-0-670-02141-3. Susan Butler, “Roosevelt and Stalin,” Published by Alfred A. Knopf, 2015, excerpts quoted from pages 95-96. Wikimedia Commons has media related to Yalta Conference. This page was last edited on 15 April 2019, at 15:13 (UTC).